With their bank accounts dwindling, Justin Ma and Matt Davis cross their fingers and subject FTL to the ultimate trial by fire: a public play test and a Kickstarter campaign to raise the money they need to finish development. FTL‘s pieces did not click together smoothly, or even linearly. Ma and Davis let the game marinate for nearly six months, taste-testing instead of following a recipe. If an idea sounded fun, they wrote the code and created the assets necessary to try it out. Around August 2011, they agreed that the game had crystallized enough to start showing it around and getting feedback. September’s Independent Games Festival China, a branch of the IGF derived from the annual GDC summit in San Francisco, seemed as good a place as any. The China-held IGF started up in 2009 as a way to entice indies from around the Pan-Pacific region to emerge from their development dens and show off their work. Participants submitted a working version of their game for consideration by a panel of judges from all corners of the games industry. Judges evaluated all submissions and appointed awards such as Best Mobile Game, Excellence in Audio, Excellence in Visual Arts, Excellence in Design, and the coveted Best Game nod. For the 2011 extravaganza, winners were promised cash and all-access passes to GDC 2012. 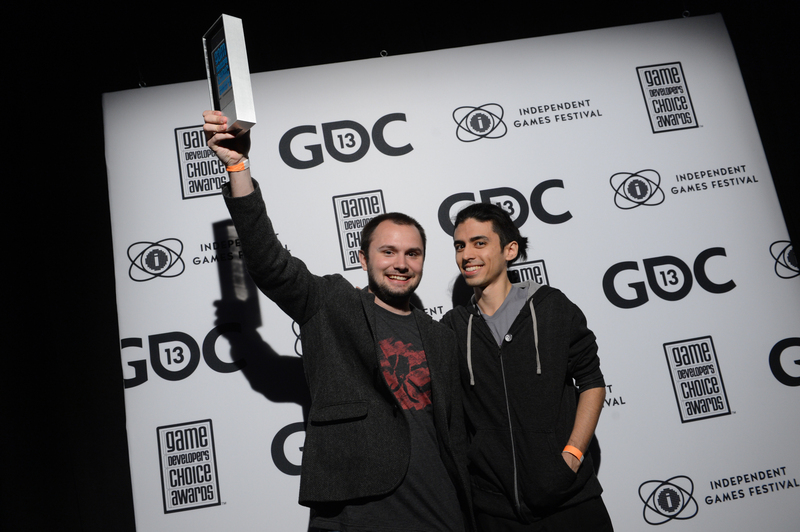 Matt Davis (left) and Justin Ma accept an award at GDC. 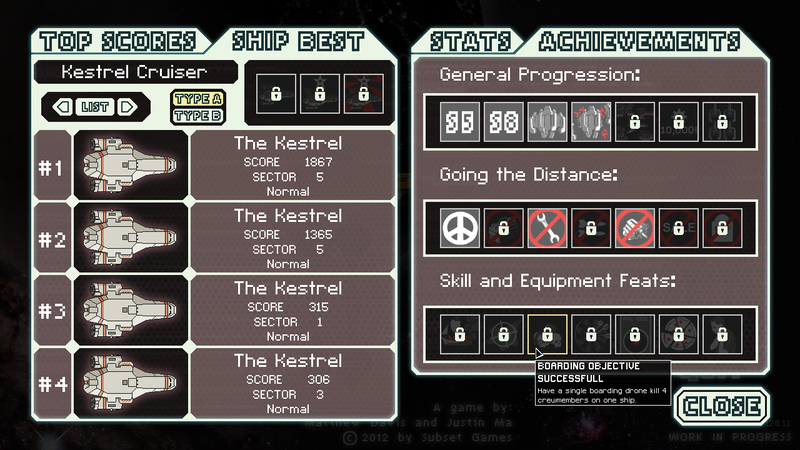 Earning achievements let players unlock new ships. While FTL‘s creators did not walk away with any prizes, making it to the finals brought about an unintended benefit. One of the judges was an editor at PC Gamer, one of the gaming industry’s most venerable magazines. The judge took Ma and Davis aside and picked their brains about FTL. “That’s actually been one fun thing about the festivals: after the judging is over, the judges often contact people behind the games they liked, either because they’re in the press and want to talk about the games, or because they thought the games were fun and they want to talk to the people who made them,” Davis said. Davis and Ma were overwhelmed by the groundswell of praise and frothing desire for the game. In early 2012, they assessed both the state of FTL and their finances. They had started the game believing it would take a few months to finish. One year later and FTL‘s design was almost set in stone save for a round or three of chiseling at rough edges. Unfortunately, their coffers were too low to finish certain important tasks. 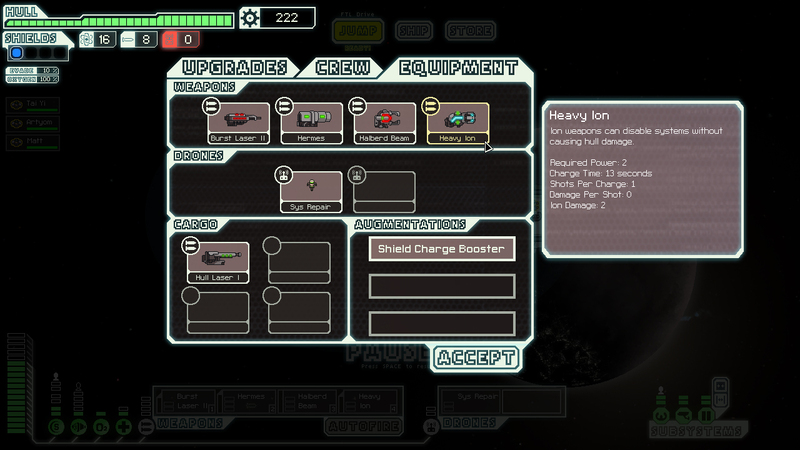 They had hired sound and music designer Ben Prunty to write music for FTL. Prunty had put together an excellent soundtrack and assorted sound effects, but had received no compensation. Until Ma and Davis could afford to pay him, Prunty was essentially a volunteer. Ma and Davis decided to turn to Kickstarter in the hopes of collecting the scant funding they needed to finish the game and put it up for sale. Kickstarter, a crowd-funding platform where creators asked communities to pitch in for funding, was fast becoming a darling in creative communities. If an individual wanted to support a project, such as a book, CD, documentary, or video game, they could pledge a certain dollar amount in exchange for rewards such as t-shirts, early access to the product, and signed artwork. Donors effectively became investors, and pledging higher amounts earned them greater rewards. But Kickstarter came with a caveat. Project creators had to reach their funding goal within a small window of time. If they came up short by even a dollar when their Kickstarter expired, they did not get a dime. Ma and Davis filled out their project page on Kickstarter. They described the game as “spaceship simulation roguelike-like” whose aim was “to recreate the atmosphere of running a spaceship exploring the galaxy,” and provided greater detail on what their game held in store.9 On behalf of the Galactic Federation, players would command a ship under fire from a growing band of rebels on the verge of overthrowing the Federation. Every jump would take them to a procedurally generated sector where a brief text read-out would describe the threat players faced there. 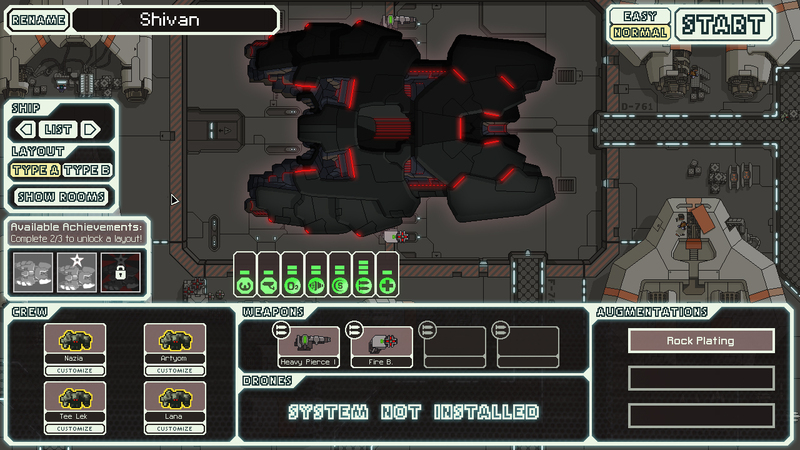 On February 27, 2012, the FTL project went live on Kickstarter. Ma and Davis officially had thirty days to hit their funding goal. Sitting at their computers in their separate Shanghai apartments, nervous and excited, they clicked the refresh button on their web browsers. A few hundred dollars appeared. They refreshed the page again. More donations had poured in. Another refresh, another fresh wave of money. Giddiness gave way to shock. In just a few hours, they charged through fifty percent of their funding goal. In twelve hours, they met it, and the groundswell of interest and enthusiasm only continued to grow. In less than twenty-four hours, the game raised $20,000, putting them at 200 percent of their goal—and they still had twenty-nine days to go. Media coverage of the game escalated. On March 5, with Kickstarter pledges still flooding in, Ma and Davis submitted a new version of FTL for consideration at the Independent Games Festival at GDC in San Francisco. FTL garnered honorable mentions in the Seumas McNally Grand Prize and Excellence in Design categories.10 OnLive, a service that let players stream games to their PC for a monthly fee, hosted a demo of FTL and other IGF finalists. Onlive ended up extending their promotion of the finalists’ demos due to high demand, giving more players the opportunity to try Ma and Davis’s game.